October 13, 2016 – Engineers at NASA Glenn’s Plum Brook Station in Sandusky, Ohio recently finished a series of tests on a full-size test version of Orion’s service module to verify that it can withstand the vibrations it will experience when it launches and travels into space atop the Space Launch System (SLS) rocket. The 13-ton service module is an essential part of the spacecraft. It will propel, power and cool Orion in addition to providing air and water for the crew. “We’re making sure that the structure on the service module will survive the extremely strong vibrations of launch and ascent on the journey to space,” said Nicole Smith, project manager for the Orion testing at Plum Brook. NASA’s SLS rocket will produce more than eight million pounds of thrust during launch, and like all spacecraft, Orion will get a good shaking during ascent. Although NASA has designed Orion and its service module to endure launch and ascent vibrations as Orion travels into space, testing on the ground helps to verify those designs before the mission. Earlier this summer, the service module test article was placed on a mechanical vibration table in Plum Brook’s Space Power Facility. At 22-feet wide and 55,000-pounds, the table is the world’s most powerful spacecraft shaker system. Engineers ran a total of 98 vibration tests throughout the summer. “We needed to see the different ways the service module would dynamically perform during launch when the tanks are full and then later in the mission after it has used some of that propellant,” Smith said. The test vibration levels started as low as 2.5 Hz and swept up to 100 Hz. 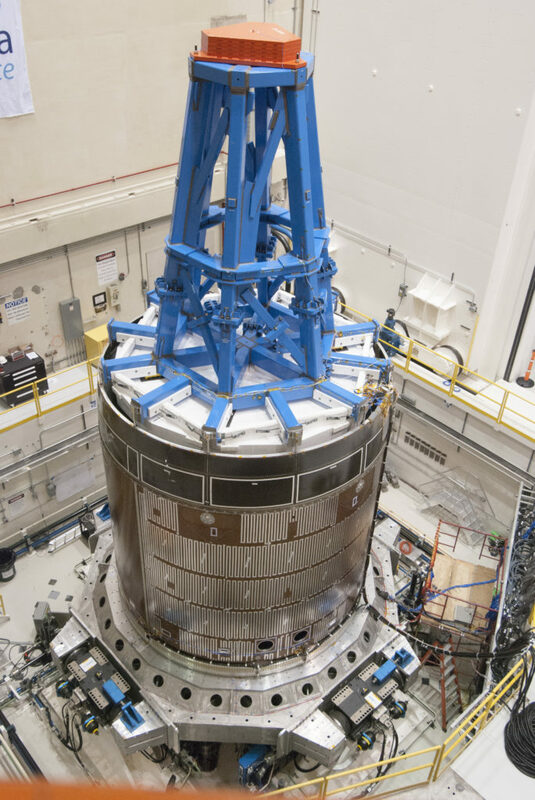 The vibration tests were part of a series of crucial checks being performed at the Space Power Facility to verify the service module for Orion’s first flight atop SLS, known as Exploration Mission-1 or EM-1, which will venture tens of thousands of miles beyond the moon. The test article’s next stop is the assembly high bay area, where engineers will fire pyrotechnics to simulate the shocks the service module will experience as Orion separates from the SLS rocket. The test article was provided by ESA (European Space Agency) and built by Airbus Defence & Space. As these ground tests continue to verify the service module’s design, the first flight unit service module for EM-1 is now being built in Europe. This unit is expected to be shipped to the United States in 2017. EM-1 is targeted to launch from Kennedy Space Center in Florida in late 2018. Orion will take crew farther in space than they’ve ever gone before and plays an essential role as part of NASA’s preparation for the Journey to Mars. The spacecraft will carry astronauts to space, provide emergency abort capabilities, sustain the crew during their mission and provide safe re-entry through Earth’s atmosphere. Lockheed Martin Space Systems of Littleton, Colorado, is the prime contractor for the Orion spacecraft.